Cynthia Carlson had been laid off from her employer as an in-home health provider. She always had hopes of becoming a registered nurse; but, through life circumstances, was unable to pursue this dream. Being laid off was a devastation to her family as she was the sole financial supporter. She was taking care of her disabled husband as well as other family obligations. Cynthia had concerns about enrolling in school due to her age and family circumstances. After much encouragement from her WIA case manager she realized that she could achieve her life-long goal of becoming a registered nurse. Cynthia’s goal as a registered nurse is to work with the geriatric population. While in training Cynthia applied for and was offered a position with Orange County Public Schools as a substitute nurse. Cynthia graduated from Germanna Community College, on December 17, 2013, with an Associate in Applied Science degree in Nursing. 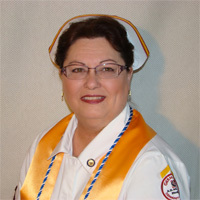 She subsequently was licensed as a Registered Nurse (RN) by the Virginia Board of Nursing.